Low-VOC Exterior Paints? What’s the Point? Lots of folks are seriously concerned about the health of their indoor environment – and for good reason. As we’ve written about before, using conventional interior paints which are high in volatile organic compounds (VOCs), can “offgas” fumes which are toxic, and potentially hazardous to the health of people. When a green product is referred to as low-VOC, it is usually referencing a synthetic, liquid solvent that gives off – or “offgasses” – toxic fumes. This is the source of the poignant smell in paints, turpentine, varnish, stains, and other finishing products, which can often cause headaches and other health issues, if they are inhaled in enough volume over time. The troubling thing about conventional products with a high-VOC content is that those substances can continue to offgas VOCs for years after it has dried, and after the poignant smell has abated: just because you can’t smell the VOCs anymore doesn’t mean you’re not still inhaling toxic fumes. For this reason, most people use low-VOC paints and stains in their interiors. But there are important reasons to use low-VOC paints and stains on the exterior of your home, or deck: many of the toxic elements in conventional finishes include heavy metals and formaldehyde – substances which can leach out into the environment over time (consider how the paints on the exteriors of homes eventually chip off). When these gasses and heavy metals leach out of finishes, or chip off into the soil, they pollute. While the amount being leached into the environment may be trace, any contribution of toxic chemicals into the environment is a negative contribution. And, if you have a garden around your house, or a well nearby, is it ultimately worth risking these toxins and heavy metals leaching into food and water supplies, when healthy, safe alternatives exist? This week Green Depot is having a 15%-off sale on a full range of paints, stains, sealants, and other finishing products. AFM Safecoat paints have both interior exterior low-VOC products available. Ecoprocote also has a number of low-VOC stains, sealers, and clear top coats. And make sure to check out Ivy Coatings primers and paints, which are available for application to both interior and exterior surfaces. To see all of the products we’re offering this week at a 15% discount, you can visit our promotion’s page by clicking here. One of the topics that might be on your mind currently is ensuring a healthy home environment. It seems that in recent weeks, contamination of the air, of water, and of food has come to the forefront of many peoples’ agendas. Chemical contamination and pollution in the home can be extensive. Whether from the cleaners we use, or the air fresheners we’ve become accustomed to, or the paints and caulks we use to build our homes, or the quality of the pipes in our home, the home environment can be rife with dangerous gases and pollutants that may harm human health. For those of us looking to conduct an extensive audit on the sources of pollution and radiation in the home, the EPA provides a booklet on indoor air quality which can be found by clicking here. But also keep in mind that Green Depot carries a full line of testing kits, as well as air purifyers. Green Depot is currently running a promotion on Austin Air purifiers – running up to 20% off. Purifiers help to keep air healthy in the home, both on an every day basis and in the event of an emergency or disaster, when the quality of indoor air may be compromised by atmospheric particulates. Water quality might also be of concern in the household. Older homes may still have lead piping. Green Depot carries a wide range of green products to help ensure the health of the indoor environment, including air and water quality testing kits and air quality monitors. These can provide an audit of your home for: bacteria in the water, lead in water, paint, and dust, carbon monoxide, radon gas, mold, pesticides in water, radon in water, asbestos, and lead surfaces. One little known fact about New York City is how famous it once was for its shellfish trade; indeed, the harvesting and shelling of oysters was once one of NYC’s primary products. Before Dutch colonists arrived in the area, shellfish were an integral part of the subsistence economy and culture of the Lenape peoples, who lived on Manhattan Island before being displaced. 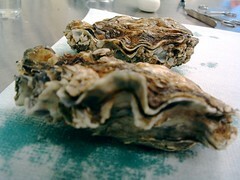 According to the Mannahatta Project – a study conducted by researchers at Columbia determining the ecology of Manhattan Island 400 years ago – oysters were consumed in large numbers, and used for cutting tools and clothing ornament; clams were used to craft necklaces that were exchanged as currency throughout the region. The harbor was also home to blue mussels, lobsters, crabs, and other edible shellfish. Over the next few centuries following settlement, the health of the waters around Manhattan began to degrade due to industrial pollution, and shellfish were overharvested leading to a massive decline in the populations of shellfish. This was sort of a cascade effect – because, amazingly, shellfish act as biological filters of chemicals and pollutants. They draw toxins out of the water and store them in their flesh, cleaning the water like a carbon filter in a water bottle. When populations began to decline because of water contamination, smaller populations of shellfish meant that the water was cleaned less efficiently, leading to high levels of pollutants: a classic feedback loop. As Grist reported earlier this week, the Museum of Modern Art is currently exhibiting a program called Rising Currents, “in which several designers presented plans for dealing with the effect of higher sea levels on the biggest city in the United States.” One of those proposals is to return a healthy shellfish population to the waters of New York harbor, ensuring cleaner water for the ecosystem and for people. Ideally, the shellfish could even be edible by 2050, assuming other water pollution mitigation efforts were successful. This plan is not only limited to the art gallery, though. New York/New Jersey Bay Keeper has actually had a repopulation program in place for a few years. The New York Harbor School, located on Governor’s Island, has undertaken a program of oyster farming in the harbor. Although it will many decades before shellfish are able to make the water in the harbor as healthy as it was 400 years ago, it’s certainly a strong step in a good direction – good for the health of the planet, and for people. While the water in New York harbor is by no means drinkable, that doesn’t mean that tap water can’t be enjoyed. While those hearty oysters continue their work of repopulating and filtering toxins out of our waterways, we can filter our own water with these green products, ensuring clean water in the home, and less plastic in the landfill. The GE Carbon Single Stage Filtration System is an under-counter single catridge filtration system from GE, improving the taste and odor of regular tap water by reducing sediment and chlorine. It fits the cold water faucet of any sink, and can be mounted horizontally or vertically. The Ovopur Water Purifier uses gravity to dispense water, requiring not electricity to operate. It is constructed from porcelain, glass, and metal and contains multiple levels of water filtration – including activated carbon, bioceramics, and quartz crystal. The filer cartridges can be returned to Aquaovo for recycling. After you’ve filtered your water, you might consider carrying it in the Kor One Water Bottle. It is a BPA-free plastic bottle that can be recycled by the manufacturer after use to be made into more Kor One bottles. For each bottle you buy, 1% of the sales go to a charity dealing with water-related issues. They’re color-coded by issue/charity: blue is for ocean protection; green is for watershed protection; orange is for bottle container recycling, and pink is for the global water crisis. Here’s a short guide to why we should care about these three kinds of waste, and the most environmentally-friendly ways to recycle or dispose of them. In the oceans are powerful currents of warm and cool water that keep the seas constantly churning. These currents are constrained by landmasses – by the continents – to create huge circular currents referred to as gyres. 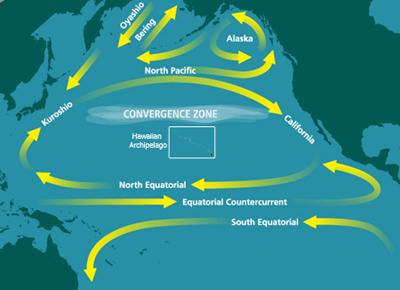 In the Pacific Ocean, one gyre is called the North Pacific Gyre. Scientists are now learning that this loop has been trapping plastics, chemical sludge, and other debris for decades, forming what some call the Great Pacific Garbage Patch. The garbage patch extends over an area that might be as large as the continental United States, or as small as the state of Texas; either way, it’s an enormous pile of garbage floating in our ocean. Nearly 30 million tons of plastic are thrown away each year, and it is predicted that 80% of the plastics in the gyre come from land sources and 20% from sea sources (although it is difficult to scientifically substantiate the sources of these plastics, and the land-to-sea ratio is contested). Regardless, some of the plastics we dispose of do inadvertently find their way into the watershed, to head out to sea. On the east coast, our trash has found its way into the North Atlantic Garbage Patch, although the Pacific patch is more notorious. The accumulation of plastic garbage in the vortex – and in our landfills, as well – is a huge cause for concern. For that reason, it’s extraordinarily important to recycle diligently and reduce plastic consumption. Many plastics, like wrappers, are unfortunately non-recyclable. But many more are – so make sure to check local recycling regulations, and sort garbage accordingly. Click here to learn more about the Pacific Garbage Patch. When we receive new gadgets at Christmas, it’s often the older, obsolete gifts we wind up submitting to the landfill. In recent years, the amount of electronic waste – or E-waste – has been growing substantially due to falling costs of technology, and planned obsolescence. In the United States, it is estimated that nearly 50 million tons of E-waste are produced each year – around 30 million computers. The EPA estimates that only 15 to 20 percent of this waste is recycled annually, and that 70% of heavy metals in landfills come from discarded electronics. This is a huge amount of waste, and runoff from electronic waste can contribute toxins like mercury, cadmium, beryllium, and lead into human and natural waterways. There are E-waste recycling options available, but one has to be careful not to choose an E-waste recycling program that damages the environment. Some E-waste recycling programs in developing nations, especially, pump non-recyclable E-waste directly into streams and landfills. In New York City, one of the most reliable and popular E-waste recycling programs is run by the Lower East Side Ecology Center. These events occur several times throughout the year (there’s one this weekend!) and more information on them can be found by clicking here. The amount of paper that Americans throw away during the holiday season is massive. Between Thanksgiving and New Year’s, Americans throw away 25% more trash than any other time of the year, according to Stanford University. This accounts for an extra 25 million tons of garbage, or one million tons per week. Even the number of Christmas cards Americans send is huge – 2.65 billion cards adds up to enough paper to fill a football field 10 stories high. If the extra trash going to the landfill isn’t enough to indicate the importance of recycling and using recycled products, also consider that when paper goes into landfills it often decays in a low-oxygen environment. Instead of simply biodegrading into the soil (or the landfill), this degrading paper can release significant amounts of methane, which is a potential greenhouse gas. Indeed, as the EPA notes, methane is roughly 20-times more powerful than carbon dioxide as a greenhouse gas. So this year, consider doing something with leftover wrapping paper besides throwing in the landfill. Reuse it for other gifts or craft projects; shred it and add it to a compost bin or mulch pile to feed your garden; use it to pad packages for mailing. Keeping trash sorted for recycling and composting isn’t especially difficult when there’s a convenient system in place. Green Depot offers a few green products to help accomplish the task. The Umbra Grand Can is a basic garbage can made from virgin polypropylene plastic with a brushed metal finish. It has a capacity of 9 ¾ gallons. Indoor composting need not be the smelly nightmare many apartment owners fear it will be. The NatureMill Home Composter fits under a kitchen counter, and using gentle electric warmth to speed up the decomposition process, ensures a steady supply of compost all winter long for the spring garden. Additionally – it’s odor-free. For a wide range of waste-reducing green products, as well as green insulation like Bonded Logic Recycled Denim Insulation, visit our website at http://greendepot.com. NYC water supply system reservoir in the Catskill mountains, by flickr user CarbonNYC. This past summer a lot of attention was paid to the issue of “hydrofracking.” Hydrofracking – or, to use the proper terminology, hydraulic fracturing – is a process of natural gas and oil extraction. The principle of hydraulic fracturing is relatively simple. Oil companies use a water mixture that is pumped into rock beds to fracture the rock and release quantities of oil and gas that can then be collected and refined. In New York state, there has been substantial controversy over this practice especially around the Catskill mountains. Underneath large areas of New York, Ohio, West Virginia, Pennsylvania, and Virginia is a layer of shale rock, known as the Marcellus Shale, that contains as much as 500 trillion cubic feet of natural gas, or the equivalent of 80 million barrels of oil. All told, the Marcellus Shale covers an area roughly 48,000 square miles. Energy companies are keen to tap into this fossil fuel resource, but there are significant environmental and human health impacts that the process entails. When an oil company wants to tap into the Marcellus Shale, they begin by clearcutting the drilling site of any forest that was once there. Then, they bore down into the shale layer, at which time they twist the drills around horizontally and extend their machinery out 8,000 feet in each direction. In the process of drilling, oil companies almost always drill through the natural water table or aquifer. In each case of hydraulic fracturing, companies utilize between six and eight million gallons of fresh water. After the initial injection of water, chemicals are added to the shale to make the process more efficient, and often consist of diesel fuel, benzene, and hydrochloric acid. There have been numerous recorded instances of these chemicals, and even perhaps natural gas and oil, leaking out during the hydrofracking process and entering into local water tables. Nearby famers and residents of hydrofracking sites have reported increased health issues that many believe are associated with the mining and extraction of natural gas by this process. Oil companies insist that the “small amounts” they inject into mining sites are benign in those quantities, but there is little government oversight to follow up on extraction and ensure that these chemicals are not leaking into the watershed. Companies are reluctant to release data on the chemicals they use, and how much of them that they use, nor are they legally required to do so. 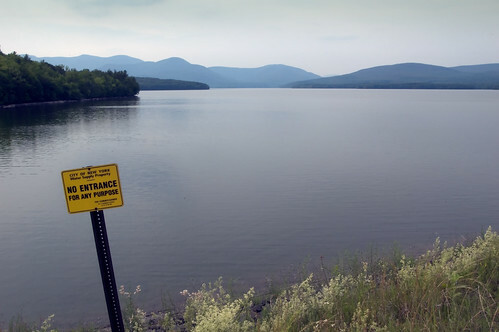 This has been an especially important issue for people living in New York state and New York City, because a large amount of our municipal water comes from reservoirs in the Catskill mountains that may be affected by runoff from hydraulic fracturing. The story of New York City’s water system is truly remarkable – for not only do our reservoirs, 80 miles away, provide an enormous metropolis all the safe drinking water they can consume, the city has also been incredibly proactive in preserving the watershed. This has ensured that the water supply to New York City is clean and naturally purified of contaminants. To date, the NYC Department of Environmental Protection has purchased or protected over 70,000 acres of land since 1997, through conservation easements. New York City’s drinking water is a very special, precious resource. It is clean, unpolluted, and naturally filtered. It should be enjoyed and celebrated! Drinking water from bottles creates a huge mess for the environment – it takes energy to extract and bottle water, to ship to stores, and then most bottles wind up going to landfill or into the oceans, rather than to recycling. So here are a few ways to enjoy New York City’s – or any municipality’s – tap water more often. Using Your Most Precious (Free) Resource: Tap Water! As the New York Times reported on Sunday, there is a growing nation-wide movement to ban the sale of bottled water on college and university campuses. Prominent institutions like Seattle University and the University of Wisconsin have reportedly banned all sales of bottled water; others, with multiyear contracts to beverage companies, have compromised and removed bottled water from their meal plans. Water is essential to life, and many of us rely on bottled water when we’re away from the home. In New York City, our tap water is unparalleled in quality, but many people are discouraged from drinking tap water because of an unsavory taste. But bottled water is expensive, and most bottles either go straight to landfills or wind up in our waterways, eventually making their way to the ocean. And this is not to mention the carbon footprint of bottled water, as those bottles are produced using petroleum products and then shipped up to thousands of miles. Bottled water is neither a cost-effective, nor environmentally-friendly way to stay hydrated. There have likely never been more options available to the consumer seeking to replace their bottled water habit with the more humble reusable water bottle. Water bottles are a reusable green product that can last years and years – long after flimsy disposable bottles have been sent to the landfill or recycling center. Aquavo’s Therm-O Bottle is a double-walled glass thermos, insulating your beverage to keep it cold or hot all day long. Some plastic water bottles contain potentially-dangerous BPAs, but that’s not a risk for this glass bottle. For those who prefer filtered water on the go, the BPA-free Bobble Water Bottle contains a built-in filter to remove chemicals and impurities. The classic Klean Kanteen is made from food-grade, 100% recyclable stainless steel – nearly indestructible, and BPA-free. The Kor One Water Bottle is a beautiful piece of design, BPA-free and designed to be melted down for reuse by the manufacturer if they are ever discarded. For more water bottles and other green products, visit Green Depot online.